I misread this card’s mana cost the first time I saw it, and thought it was cheaper. While I was waiting to get new glasses, though, I realized that there it still has a number of interesting uses, not least anything that lets you put it into play for free, along the lines of Enduring Ideal. I don’t know if such decks would want to run it in more competitive settings, as it’s not terribly fast at killing people and is probably impossible for most such decks to cast if they draw it. It might find more of a niche in multiplayer, even though it won’t uniformly benefit its caster and often just end up causing chaos. That is pretty on-theme for Rakdos, of course. Captive Audience looks an awful lot like Demonic Pact. Only for your opponent. 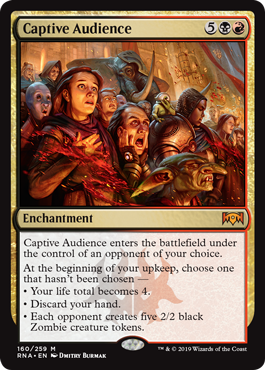 While the “pick your own punishment” style of card is not always the best way to go, Captive Audience more or less offers a suite of effects costed close to that 7-mana mark, where all of them are bad news. They can lose their hand, set their life total to 4, or give everyone else hordes of Zombies. Captive Audience quits working when it’s gone through its suite of effects, but the damage should be done and they should be dead by that point. As a seven-mana enchantment, it does have a bit to go to be good, but all three effects are powerful (even if they get to choose the order in which they happen). Captive Audience can be a good way for Rakdos to break through a stalemate…though I don’t know what its Standard prospects are, a bit of late-game inevitability makes for a good fallback, right?